Greece is an enchanting destination too magical for words. It is the birthplace of civilization. Rich in history, mythical legends, art and architecture one never tires of exploring there. One must not leave without visiting the famous Acropolis and its new museum in Athens. If one ventures outside of the city they can visit the awe inspiring sites of Delphi, Olympia and Meteora. In addition, Greece has approximately 4000 islands. It is an idyllic country for your island-hopping adventure. Whether you prefer to hike in the mountains or swim in the most beautiful turquoise waters in the world there is an island to suite everyone! Let Apollo Tours be your guide! Day One Private arrival transfer to hotel in Athens. Remainder of day at leisure. 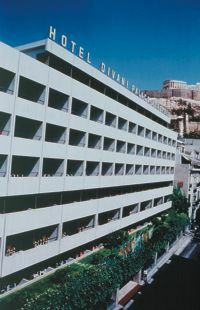 Day Two After breakfast at hotel, depart for half-day Athens City Sightseeing Tour visiting the city’s highlights including the Acropolis and the Parthenon. Remainder of day at leisure. Day Three Breakfast at hotel. Day at leisure. 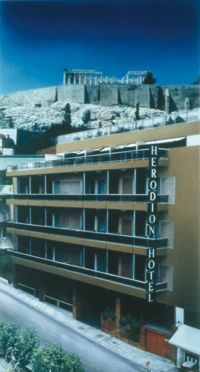 Day Four After breakfast at hotel, depart for one day Saronic Island Cruise visiting Hydra, Poros and Aegina. Lunch on ship is included. Return to hotel. Day Five Breakfast at hotel. Day at leisure. (Choose from optional tours available or shopping). Day Six Breakfast at hotel. Day at leisure. (Choose from optional tours available or shopping.) Day Seven After breakfast at hotel, private transfer from hotel to the airport for departure. Day One Private arrival transfer to hotel in Athens. Remainder of day at leisure. 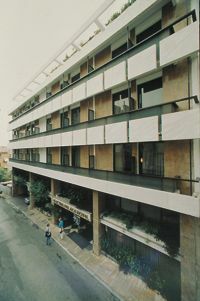 Day Two After breakfast at hotel, depart for half-day Athens City Sightseeing Tour visiting the city’s highlights including the Acropolis and the Parthenon. Remainder of day at leisure. Day Three Breakfast at hotel. Private transfer to airport for domestic flight to Mykonos. Upon arrival on island, transfer from airport to hotel. Remainder of day at leisure. Day Four After breakfast at hotel, enjoy day at leisure in Mykonos. Day Five Breakfast at hotel. Full day at leisure. You may take a short ferry ride to the island of Delos, the ancient, holy island and birthplace of the god Apollo. Day Six Breakfast at hotel. Day at leisure followed by a late afternoon transfer from hotel to pier to embark on 3-Day Louis Cruise. Day Seven Today’s ports of call are Kusadasi, Turkey where you have the opportunity to visit the ancient city of Ephesus followed by a visit to the island of Patmos. Here you can visit the Grotto of St. John, where portions of the Bible are believed to have been written. Day Eight Today’s port of call is the island of Rhodes. You will have a full day here to visit the medieval Old City and the castle that was used as a refuge by the Knights of St. John during the Crusades. An optional shore excursion to the white-washed village of Lindos is available. Day Nine After breakfast on board ship, meeting and assistance at port, followed by private transfer to the airport for departure. Day One Private arrival transfer to hotel in Athens. Remainder of day at leisure. 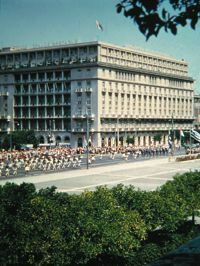 Day Two After breakfast at hotel, depart for half-day Athens City Sightseeing Tour visiting the city’s highlights, including the Acropolis and the Parthenon. Remainder of day at leisure. Day Three Breakfast at hotel. Private transfer from hotel to Piraeus for departure on 4-Day Louis Cruise. First port of call this evening is the island of Mykonos, famous for its winding streets and windmills. Day Four Today’s ports of call are Kusadasi, Turkey and the island of Patmos. In Kusadasi, you have the opportunity to visit the ancient city of Ephesus. On Patmos, you can visit the Grotto of St. John, where portions of the Bible are believed to have been written. Day Five Today’s port of call is the island of Rhodes. You will have a full day here to visit the medieval Old City and castle that was used as a refuge by the Knights of St. John during the Crusades. An optional shore excursion to the whitewashed village of Lindos is available. Day Six Today’s ports of call are Crete, which offers an opportunity to visit the Minoan ruins of Knossos and the mystical island of Santorini, famous for its cliffside village. Disembark ship in Santorini and be met by the local island representative who will transfer you to your hotel in Santorini. Remainder of evening at leisure. Day Seven Breakfast at hotel. Enjoy day of leisure in Santorini. Day Eight Breakfast at hotel. Full day of leisure. You may opt to take a tour of Akrotiri (not included) where you will tour the remains of a city dating back to 1500 b.c. that was buried in ash as a result of the volcanic eruption that destroyed the island. Day Nine After breakfast at hotel, transfer from hotel to airport for departure. Day One Private arrival transfer to hotel in Athens. Remainder of day at leisure. Once at the hotel, you may relax or venture out to explore the city. Recommended is a visit to the Plaka area, with its ceramic tiled roofs, white- washed or pastel-colored walls, neoclassic buildings, and ornate, wrought-iron balconies. Day Two Breakfast at hotel. The optional Athens City Sightseeing Tour is recommended (not included). Day at leisure. Day Three Breakfast at hotel. The optional full-day tour of Delphi is recommended (not included). Day at leisure. Day Four After breakfast at hotel, transfer to the airport for domestic flight to the island of Mykonos. On arrival, private transfer to hotel. Mykonos is considered one of the most cosmopolitan of all the Greek islands, attracting intellectuals and well-known artists. Day at leisure. Day Five After breakfast at hotel, explore Mykonos. Mykonos has many cafes overlooking its colorful port; here you can relax, sip your coffee, and people- watch. Day at leisure. Day Six Breakfast at hotel. A day trip to Delos, the ancient sacred island of Apollo, is optional. Day Seven After breakfast at hotel, transfer to your hydrofoil to the island of Santorini. On arrival, private to hotel. Santorini, a volcano island of savage and picturesque beauty, is thought by some archeologist to be the lost city of At- lantis. Day at leisure. Day Eight After breakfast at hotel, explore the village of Oia. Oia is known for its traditional little houses and its spectacular sunsets. Day at leisure. 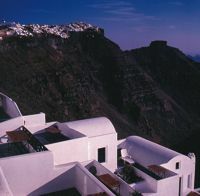 Day Nine After breakfast at hotel, visit the archeological sights on the islands of Ancient Thira and Akrotiri. Day at leisure. Day Ten After breakfast at hotel, transfer to the port for your hydrofoil to the island of Crete. On arrival, private transfer to hotel. While in Crete, you may relax or venture out and explore the many fascinating areas and striking con- trasts the island has to offer. Day at leisure. Day Eleven After breakfast at hotel, we recommend that you visit both the archeological museum and the historical museum, which include specimens of the Minoan civilization. Day at leisure. Day Twelve After breakfast at hotel, we suggest a visit to the ruins at Knos- sos, the legendary home of the Minotaur. Day at leisure. Day Thirteen After breakfast at hotel, day at leisure. 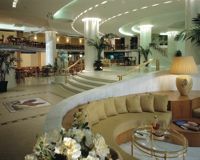 Day Fourteen After breakfast at hotel, transfer to the airport for your domes- tic flight back to Athens. Transfer to international terminal for your flight home. Day One Private arrival transfer to hotel in Athens. Remainder of day at leisure. Day Two After breakfast at hotel, depart for half-day Athens City Sightseeing Tour—visit the city’s highlights, including the Acropolis and the Parthenon. Remainder of day at leisure. Day Three After breakfast at hotel, depart on 4-Day Classical Tour. Leave Athens for the Corinth Canal and Mycenae. Lunch in Nafplion and on to the ancient theater of Epidaurus. Overnight in Nafplion. Day Four After breakfast at hotel, depart for Olympia, site of the first Olympic games. After lunch, visit the Sancturary of Zeus and the museum. Overnight in Olympia. Day Five After breakfast at hotel, depart via Patra to Rion; then cross the Corinthian Gulf by ferry to Antirion. Drive to picturesque Nafpaktos and on to Delphi, site of the famous ancient oracle. After lunch visit the antiquiries and Museum. Overnight in Delphi. Day Six After breakfast at hotel, continue sightseeing at Delphi until lunch. Then depart for Athens with a stop in the town of Arachova, famous for its carpets. Overnight this evening in Athens. Day Seven After breakfast at hotel, private transfer to Piraeus for departure on 7-Day Louis Greek Island and Turkey Cruise aboard the Orient Queen. Evening on board. Overnight at sea. Day Eight Today’s ports of call are Crete, which offers an opportunity to visit the Minoan ruins of Knossos, and the mystical island of Santorini, famous for its cliffside villages. Overnight at sea. Day Nine Today’s port of call is the island of Rhodes. You will have a full day here to visit the medieval Old City and the castle that was used as a refuge by the Knights of St. John during the Crusades. An optional shore excursion to the whitewashed village of Lindos is available. Overnight at sea. Day Ten Today’s ports of call are Patmos and Kusadasi, Turkey. In Patmos, you can visit the Grotto of St. John, where portions of the Bible are believed to have been written. In Kusadasi, Turkey, you have the opportunity to visit the ancient city of Ephesus. Day Eleven Today’s port of call is the fascinating city of Istanbul. Opportunity to visit the famous Topkapi Palace, the world’s largest covered Bazaar, the Blue Mosque and Agia Sophia. Overnight on ship in Istanbul. Day Twelve Today continue sightseeing in Istanbul. Early evening sailing through the Bosphorus. Overnight at sea. Day Thirteen Today’s port of call is the island of Mykonos, famous for its whitewashed villages, its 365 churches, and its picturesque harbor. Overnight at sea. Day Fourteen Breakfast on board ship, meeting and assistance at port, followed by private transfer from ship to the airport for departure. Day One Private arrival transfer to hotel in Athens. Remainder of day at leisure. 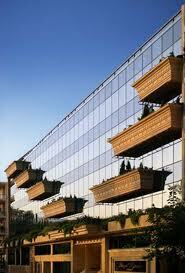 Once at the hotel, you may relax or venture out to explore the city. Recommended is a visit to the Plaka area, with its ceramic tiled roofs, white- washed or pastel-colored walls, neoclassic buildings, and ornate, wrought- iron balconies. Day Two Breakfast at hotel. The optional Athens City Sightseeing Tour is recommended (not included). Day at leisure. Day Three Breakfast at hotel. The optional full-day tour of Delphi is recommended (not included). Day at leisure. Day Four After breakfast at hotel, private transfer to the airport for domestic flight to the island of Mykonos. On arrival, private transfer to hotel. Mykonos is considered one of the most cosmopolitan of all the Greek islands, attracting intellectuals and well-known artists. Day at leisure. Day Five After breakfast at hotel, explore Mykonos. Mykonos has many cafes overlooking its colorful port; here you can relax, sip your coffee, and people-watch. Day at leisure. Day Six Breakfast at hotel. A day trip to Delos, the ancient sacred island of Apollo, is optional. This uninhabited island is one vast archeological site, extending almost the entire length of the island. Day at leisure. Day Seven Breakfast at hotel. Day at leisure in Mykonos. Day Eight After breakfast at hotel, transfer to the port for hydrofoil to the island of Paros. On arrival, transfer to hotel. Paros is the third largest island of the Cyclades and is considered to be one of the most beautiful with the most exquisite beaches. Day Nine After breakfast at hotel, discover Parikia, the capital of Paros. You might visit the famous church of Katapoliani, one of Greece’s most important Byzantine monuments. Also visit the Venetian castle and the Archaeological Museum. Day at leisure. Day Ten After breakfast at hotel, you might take a short trip to nearby Antiparos Island and visit its spectacular caves and incredible beaches. Day at leisure. Day Eleven After breakfast at hotel, transfer to the port for your hydrofoil to the island of Santorini. On arrival, transfer to hotel. Santorini, a volcano island of savage and picturesque beauty, is thought by some archeologist to be the lost city of Atlantis. Day at leisure. Day Twelve After breakfast at hotel, explore the village of Oia. 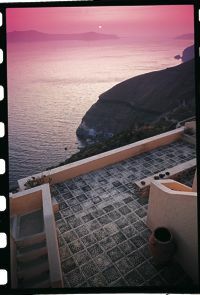 Oia is known for its traditional little houses and its spectacular sunsets. Day at leisure. Day Thirteen After breakfast at hotel, visit the archeological sights on the islands of Ancient Thira and Akrotiri, which are the remains of cities dating back to 1500 B.C. that were buried in ash as a result of the volcanic eruption that destroyed the islands. Day at leisure. 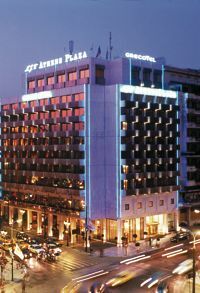 Day Fourteen After breakfast at hotel, transfer to the airport for your domestic flight back to Athens. Transfer to international terminal for your flight home. (Daily) Depart 8:30 a.m., Return 7:00 p.m.
Athens The starting point for any trip to Greece, Athens, is a bustling cosmopolitan city offering its visitor a variety of shopping, dining and sightseeing options. 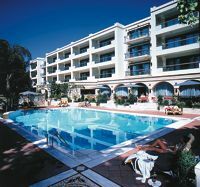 260 sound proofed rooms, 11 suites, fully air-conditioned, swimming pool, wheelchair accessible, 1 restaurant, 2 bars, fitness center, 24-hour room service, parking, connecting rooms, direct-dial phone, hairdryer, mini-bar, safety deposit box, satellite-TV, internet access, breakfast included. 515 rooms, 44 suites, fully air-conditioned, 4 restaurants, 2 lounges, swimming pool, health club, 24-hour room service, color tv, satellite channels, mini-bar, breakfast included. 154 rooms, 28 suites, fully air- conditioned, bar, restaurant, plaza, lounge, business center, 24-hour room service, mini-bar, hairdryer, safe, satellite tv. 90 rooms, fully air-conditioned, bar, cocktail lounge, cable tv–cnn, refrigerator, hairdryer, in-room safe. Santorini This mystical volcanic island offers black sand beaches and whitewashed villages perched atop cliffs overlooking the blue waters of the Aegean. Ideal for honeymooners and couples looking for an enchanting getaway. Mykonos A favorite island among the jet set, Mykonos is known for its whitewashed villages, windmills, beautiful beaches, nightlife and picturesque harbor. Rhodes The Island of Roses, Rhodes is famous for its Medieval Old City. 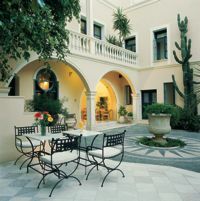 Rhodes will appeal to the traveler who is seeking a variety of beaches, resort-type accommodations and shopping. Golﬁng is also available. 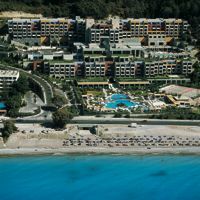 400 rooms, refrigerators in all rooms, fully air-conditioned, 3 restaurants and bars, 3 fresh-water swimming pools, water sports center, fitness club, 4 tennis courts, breakfast included. Crete Home of the famous Palace of Knossos and the Samaria Gorge, Crete is one of the most diverse of the Greek Islands. Here one can choose to stay at one of a multitude of beautiful seaside resort towns. 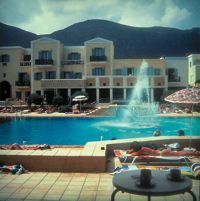 Crete offers some of the ﬁnest resorts in Greece to satisfy the most discerning traveler. 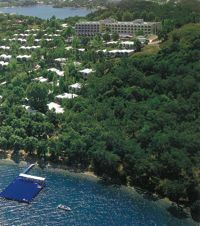 245 rooms, 7 suites, 48 apartments, air- conditioning upon request, 2 restaurants, 4 bars, swimming pool, breakfast included. Paros A charming Cycladic Island, Paros boasts traditional villages, picturesque monasteries, and some of the best beaches in Greece. 60 rooms, fully air-conditioned, phone, gourmet restaurant, room service, 3bars, water sports, tennis courts, marble bathrooms, mini-bar, TV, veranda or balcony, breakfast included. 21 rooms, air-conditioning, car and bike rentals, satellite TV, kitchenette, swimming pool with jacuzzi, breakfast bar. 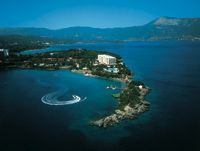 Corfu Corfu is the most famous of the Ionian Islands. It owes much of its sophistication and charm to the meshing of Venetian and British inﬂuences. 176 rooms, 112 bungalows, 8 suites, fully air-conditioned, restaurant, 3 bars, swimming pool, tennis courts, water sports, near 18-hole golf course. 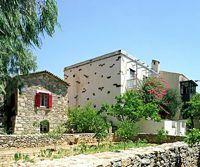 Samos A traditional Greek Island offering picturesque villages, archaeological sights and beautiful beaches. Ideal for those looking for a more traditional and less crowded island. 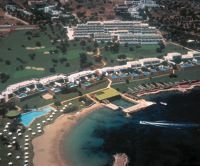 125 bungalows, fully air-conditioned, restaurant/taverna, bars, swimming pool, tennis court, water sports, breakfast included.